The following example demonstrates how you can use the STDIZE procedure to obtain location and scale measures of your data. In the following hypothetical data set, a random sample of grade twelve students is selected from a number of coeducational schools. Each school is classified as one of two types: Urban or Rural. There are 40 observations. The variables are id (student identification), Type (type of school attended: ‘urban’=urban area and ‘rural’=rural area), and total (total assessment scores in History, Geometry, and Chemistry). The following DATA step creates the SAS data set TotalScores. Suppose you now want to standardize the total scores in different types of schools prior to any further analysis. Before standardizing the total scores, you can use the box plot from PROC BOXPLOT to summarize the total scores for both types of schools. To request this graph, you must specify the ODS GRAPHICS statement as follows. For more information about the ODS GRAPHICS statement, see Chapter 21, Statistical Graphics Using ODS. The PLOT statement in the PROC BOXPLOT statement creates the schematic plots (without the serifs) when you specify boxstyle=schematic noserifs. Figure 82.1 displays a box plot for each type of school. Inspection reveals that one urban score is a low outlier. Also, if you compare the lengths of two box plots, there seems to be twice as much dispersion for the rural scores as for the urban scores. Figure 82.2 displays the table from PROC UNIVARIATE for the lowest and highest five total scores for urban schools. The outlier (Obs = 3), marked in Figure 82.2 by the symbol ‘0’, has a score of 64. Figure 82.3 displays the table of location and scale measures from the PROC STDIZE statement. PROC STDIZE uses the sample mean as the location measure and the sample standard deviation as the scale measure for standardizing. The PSTAT option displays a table containing these two measures. The ratio of the scale of rural scores to the scale of urban scores is approximately 1.4 (41.96/30.07). This ratio is smaller than the dispersion ratio observed in the previous schematic plots. Figure 82.4 displays the table of location and scale measures when the standardization method is median absolute deviation (MAD). The location measure is the median, and the scale measure is the median absolute deviation from the median. 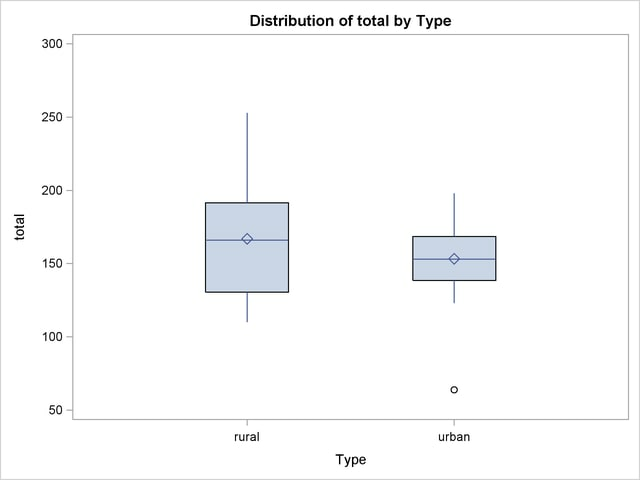 The ratio of the scale of rural scores to the scale of urban scores is approximately 2.06 (32.0/15.5) and is close to the dispersion ratio observed in the previous schematic plots. Figure 82.5 displays the table of location and scale measures when the standardization method is IQR. The location measure is the median, and the scale measure is the interquartile range. The ratio of the scale of rural scores to the scale of urban scores is approximately 2.03 (61/30) and is, in fact, the dispersion ratio observed in the previous schematic plots. For rural scores, the location estimate for MAD is 166.0, and the scale estimate for MAD is 32.0. The maximum of the rural scores is 253 (not shown), and the minimum is 110 (not shown). Thus, the tuning constant needs to be 3 so that it does not reject any observation that has a score between 110 to 253. For urban scores, the location estimate for MAD is 153.0, and the scale estimate for MAD is 15.5. The maximum of the rural scores is 198, and the minimum (also an outlier) is 64. Thus, the tuning constant needs to be 4 so that it rejects the outlier (64) but includes the maximum (198) as an normal observation. The maximum of the tuning constants, obtained in steps 1 and 2, is 4. See Goodall (1983, Chapter 11) for details about the tuning constant. The ratio of the scale of rural scores to the scale of urban scores is approximately 2.06 (32.0/15.5). It is also close to the dispersion ratio observed in the previous schematic plots. The preceding analysis shows that METHOD=MAD, METHOD=IQR, and METHOD=ABW all provide better dispersion ratios than METHOD=STD does. You can recompute the standard deviation after deleting the outlier from the original data set for comparison. The following statements create a data set NoOutlier that excludes the outlier from the TotalScores data set and invoke PROC STDIZE with METHOD=STD. Figure 82.7 displays the location and scale measures after deleting the outlier. The lack of resistance of the standard deviation to outliers is clearly illustrated: if you delete the outlier, the sample standard deviation of urban scores changes from 30.07 to 22.09. The new ratio of the scale of rural scores to the scale of urban scores is approximately 1.90 (41.96/22.09).